Planning is a great tool for success. From sports and business to personal growth and goal-setting, planning provides the roadmap to get you from point A to your end result goals. Our pets ask for little from us, but they need a plan, too. And it’s up to us to devise it and put it into practice. In short, a good wellness plan for your pet involves yearly vet visits that are designed to detect non-wellness in its early stages. At Tampa Vet, we keep detailed records of all our patients’ medical histories. We also get feedback from pet owners that tell us a lot about what is happening inside the animal. This allows us to spot negative changes from visit to visit and take fast action when necessary. Here’s a stat that might alarm you: since 2001, there has been a 21-percent drop in dog visits to the vet and a 30-percent decline in cat visits. This is especially sad because of the fact that veterinary medicine is more advanced and capable than ever in both the treatment and prevention of diseases. Every doctor in every field of medicine is battling the Internet. No, we aren’t battling the information it can bring to those of us who practice medicine, but rather the often misinformation it brings to pet owners. With Google at our fingertips and a gazillion articles and opinions about health out there, people figure they can just go online and solve their pets’ problems. Unfortunately this isn’t the case. 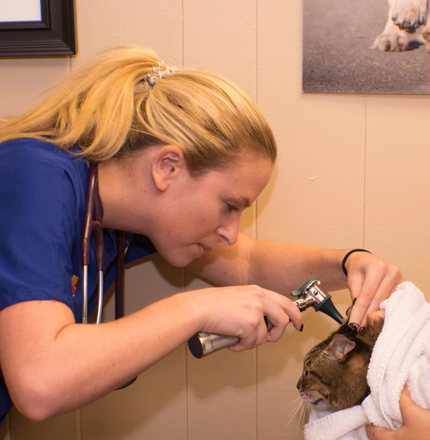 Only a licensed veterinarian can examine, diagnose and treat health problems in animals. There’s nothing wrong with pet owners informing themselves, but they need to take this information to their vet to have it sorted out. Unexpected changes in weight are often the first sign that something is amiss. Ear infections are painful and dangerous for animals, so we never overlook the ears. We can quickly determine the health of our pet-patients’ eyes and spot early signs of cataracts and other maladies. Here we’re looking for any unusual discharge, which could point to infection or respiratory problems. We check for signs of gum disease, tooth decay, tartar buildup, inflammation and other important signs of dental problems. Hair loss, flaking skin, lumps and bumps and other conditions tell us a lot about a pet’s general health. We also inspect for fleas and ticks. 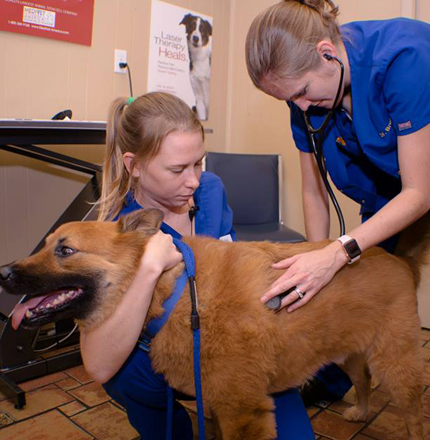 We need to know if the pet has a heart murmur, lung abnormalities or other internal issues. A stethoscope and our years of practice help us determine this. These are some of the components of a thorough wellness exam. If your pet doesn’t have a sound wellness plan in place, let us help you put one together and give your dog or cat a better, happier and healthier life.